Inspiration is all around -- just look at this beautiful flower on the Hong Kong Orchid tree growing in the parking lot of a market in Kona. I would love to design a Hawaiian quilt based on this flower and/or it's sort of heart-shaped leaves. I'll have to let that thought simmer for while. First I have to finish a tote bag I'm making as an experiment. 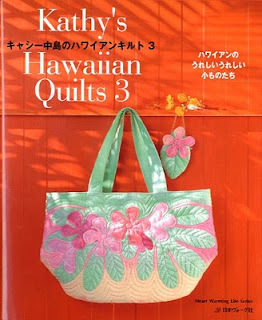 I'm using part of the applique pattern shown above on the cover of Kathy Nakajima's book Kathy's Hawaiian Quilts 3. I'm doing it in turquoise and pink on a muslin background. I'll use this for the front of the tote bag. I want to make it a different shape and size than the one shown on the cover -- definitely larger and probably more of the traditional tote bag shape and size. The applique is almost done. If it works out, my plan is to make more using my hand dyed fabrics instead of the muslin.